Ginger spice rocks the world ! No, I am not talking pop music this week, but thought with so much interest generated by the garlic articles this last two weeks <click here> I would follow up with articles on other spices starting this week and throughout February. Needless to say it is the regal ginger this week . . . the perfect partner to garlic in many recipes. A rhizome of such great notoriety, fame, legend and countless uses in the kitchen. Rhizome simply means it is the swollen part of a root. 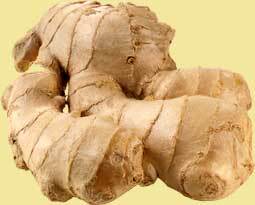 Ginger (Zingiber officinale) is an exotic, distinctive-tasting spice that has a culinary history dating back millennia. It was also used in Japan by powerful shoguns in their family crests, carried in special little personal pouches and boxes hung from belts or the obi (sashes) from kimonos, in China they continue to be an important part of traditional medicine; it is said to ease nausea and improve circulation. Sailors have used ginger to ward off sea sickness and many people who have to drive on hilly, windy roads take along candied ginger to aid motion sickness. Ginger is often referred to as green, black or white. The green ginger is the fresh root before it is dried, while black or white depends on whether it is peeled or not before it is dried and / or powdered. It is found in many forms: from the fresh root form to candied / crystallised, powdered, pickled, or as a tea. A staple in Asian cuisines where it forms part of the magical triangle; the first three ingredients used to start most dishes: ginger, garlic, onions and chillies. You will find that most Asian dishes start with three of these ingredients. But also used in European cuisine for centuries; who can forget those childhood memories of gingerbread men, ginger beer or brandy snaps? Fresh / green : look for a fresh hand of ginger that is plump and full, not wrinkled; like people it becomes wrinkled with age. The hand should have some weight to it, full of moisture and ginger that distinctive ginger aroma. The skin should have a sheen, I recommend that you only buy what you need or you intend to use right away. Don't be afraid to break off a finger (the knobby area) at the grocery store . . . I do and what you leave behind will surely be the amount the next person needs! Store it like you would potatoes; in a dark, temperate place, but not in the refrigerator. It will start to grow mould. If you do have too much, then peel it and place in oil, white wine vinegar or dry sherry, this will then take on a gingery flavour and can be used in your cooking or form part of a marinade. Ginger is pungent in flavour and a warm spice that brings depth and flavour to dishes. Like garlic it may be used sparingly for fragrance or in abundance for real flavour. The fresh root should be peeled and then grated, sliced into coins, cut into matchsticks, sliced across matchsticks for finely chopped or crushed. How it is prepared depends on how it is to be used within the recipe. I posted a wonderful recipe in December for Ginger encrusted fish. This week lets go for something sweet. This recipe has a triple hit of ginger: it uses three versions of the spice; crystallised, powdered and the fresh, if you know of a more gingered, gingerbread I would love to hear from you! I like to serve this, sliced with a good cheddar and fresh fruits for a dessert that I am sure will impress to all that you serve it to. Enjoy your Gingerbread and bon appetit . . . . .